Each player takes a ship's hold board, a ship and a matching set of action cards, which are shuffled and placed facedown above the holds. 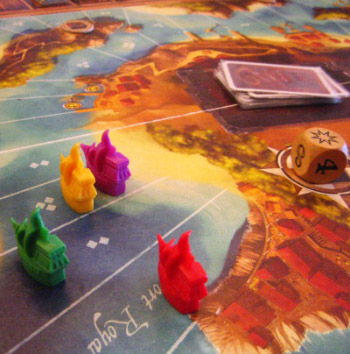 Ships are placed on the Port Royale space on the board. Randomly select 9 of the 12 treasure cards, shuffle them and place them facedown on the space to the right of the navigation box. The remaining 3 cards go back in the game box unseen. Place the combat die on the fortress and the 9 treasure tokens on the 9 pirate lair spaces on the board. Sort the resources (food, gunpower and doubloons) by type by the side of the board to form the bank. Each player places 3 food tokens and 3 doubloons in two of his holds, and draws the first 3 cards from his action deck, keeping them secret. Randomly select a first player. He gets the compass and the 2 action dice and is Captain for the first turn. Throw Action Dice The Captain throws the action dice and chooses which order to place them on the navigation box. Choose Card Each player chooses an action card (discards are shuffled to form a new deck if required) and puts it facedown across their discard pile. Actions The Captain turns over his action card and carries out his morning action (top left), then his evening action (top right). In turn, the other players reveal their cards and carry out their actions. The morning action must be completely resolved before the evening action. End of Round Each player takes the top card of their action deck and the compass moves to the next player clockwise, who is now Captain. 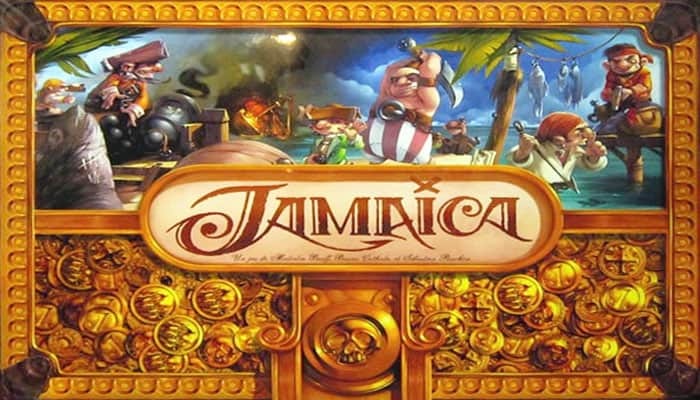 If a loading symbol is shown (food, gunpower or doubloons) the player must load the number of tokens shown by the action die into an empty hold. If the player does not have an empty hold then one must be emptied (return tokens to the bank) to make room. A hold containing the same type of token as the one you are loading cannot be emptied. If all holds are filled with that type, the action is ignored. If a movement symbol is shown the player must move his ship forwards (green) or backwards (red) the number of spaces shown by the action die. A player may move backwards on his first movement, but an entire circuit of the island must be completed to win the game. If the final space of the move is occupied, combat must immediately take place. After any combat, the cost of the space must be paid. The player landing in an occupied space is the attacker. If there is more than one opposing ship, the attacker chooses who to fight, and there is only one battle. No combat can take place in Port Royale. The attacker spends the number of gunpowder tokens of his choice and adds that number to the result of a combat die roll. This is his combat strength. The defender then does the same. The player with the higher strength wins. If there is a tie, nothing happens. If a player rolls the star, he immediately wins the battle (his gunpowder is still used). If the attacker, the defender cannot defend himself. If the defender, he wins regardless of the combat strength of the attacker. Steal the contents of one of the loser's holds (usual loading rules apply). Steal a treasure from the loser (you cannot first look at a player's facedown treasures). Give a cursed treasure to the loser. A port space costs the number of doubloons shown on the golden needle (paid to the bank). A sea space costs the number of food tokens shown by the white squares (paid to the bank). 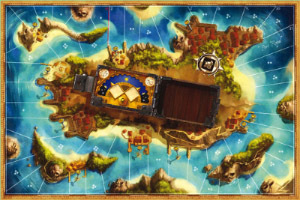 A pirate lair space costs nothing; if the treasure token is still there, it is removed from the game and the player takes a treasure card, putting it next to his holds. If a player cannot pay a space's cost there is a shortage. The player pays to the bank as much as he can afford, then moves his ship back to the first space where he is able to pay the full cost (even a pirate lair, where there is nothing to pay and he may take the treasure, if there). He may choose the route if there is a fork. He must then pay the cost of the new space. If the space is already occupied there is a battle first. Treasures modify a player's score at the end of the game (cursed treasures negatively). They are placed facedown by a player's holds and only revealed at the end of the game. A player can have more than one treasure card, and any treasure can be stolen or given during combat. Four of the treasure cards are special powers. They are placed faceup by a player's holds. The player may use the power as long as he has the card. The player can have 4 action cards in his hand. Allows the player to re-roll his own combat die or make his opponent re-roll his (even the star). The second result must be accepted. +2 to the combat die. Acts as a sixth hold (usual loading rules apply). As soon as a player reaches Port Royale, he stops. Any remaining evening action he has is ignored. The current game round is finished normally, the game ends and players add up their points. Final Score = the white number on the space where the player's ship is plus any doubloons in his holds plus any treasures minus any cursed treasures. Ending on the -5 space or before it costs 5 points. The winner is the player with the highest number of points. On a tie, the player furthest along in the race wins. Otherwise tied players share the victory.